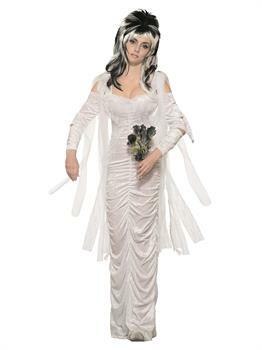 This Womens Haunted Bride Costume will give everyone that eerie feeling that someone is watching you from afar yet alone a dead blushing bride! Featuring an all-white soiled wedding dress with bodice corset top with split sheer sleeves, skirt with tulle layering underneath and a neck choking choker. If you’re up for the ghoul haunting grave theme buy this costume today!